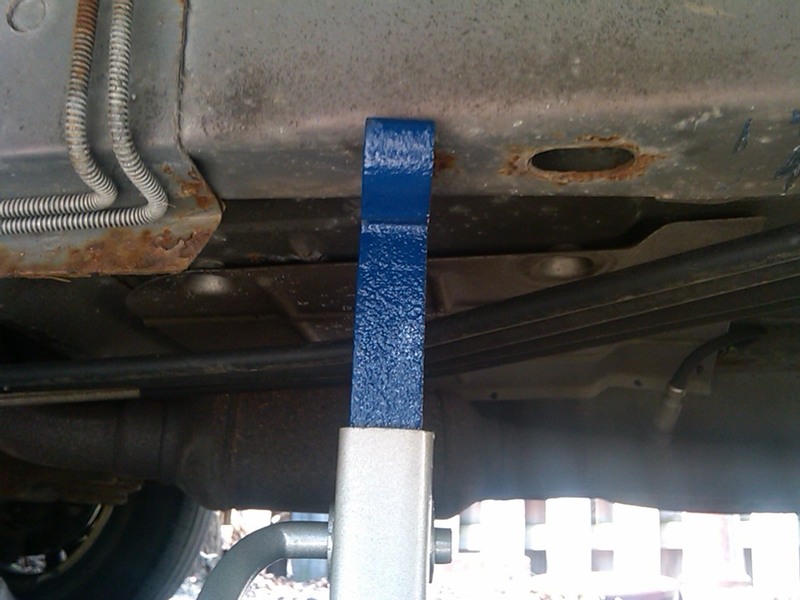 This article will show you how to lift a Chevy Venture van using a floor jack and jack stands. This procedure may work on other vehicle types and models, such as cars and trucks. The key is to use the proper sized heavy duty floor jacks and jack stands to lift your vehicle, and locate the proper area of the vehicles frame to place the jack and stands. Please use caution and follow all manufacturers instructions and warnings. Refer to you vehicles owner manual for complete instructions. Follow all safety instructions and guidelines. Work on an even surface. Heavy duty floor jack (2 ton and up weight capacity recommended). 1-2 heavy duty jack stand(s) (Note: jack kits are available at your local auto parts store). Bricks, heavy rocks, or heavy wooden beams to keep van from rolling. Any safety equipment and tools needed for your vehicle repair job. 1. 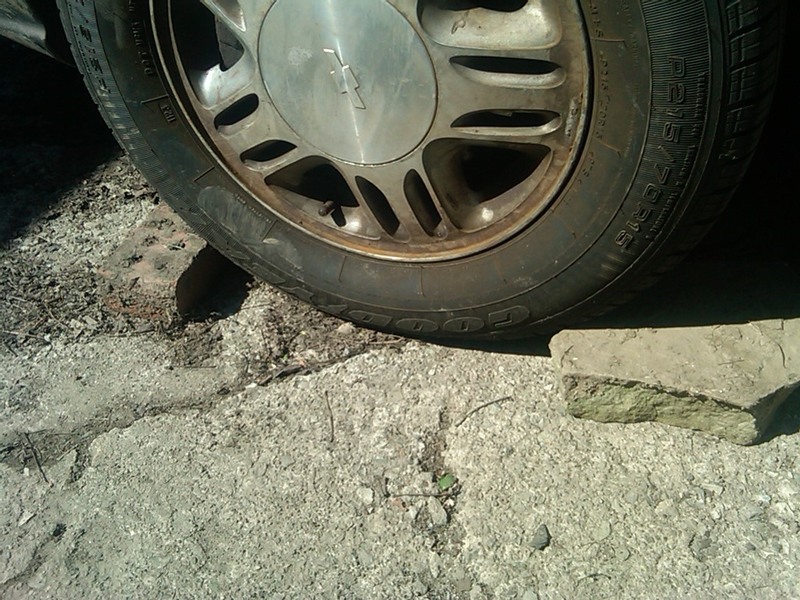 Place a brick, nice-sized heavy rock, or beam in front and back of your vehicle tires and apply the emergency brake to hinder the van from rolling back or forth. (1) Place stoppers (brick, rock, wooden beam) in front of the tires that are opposite from where you are working. 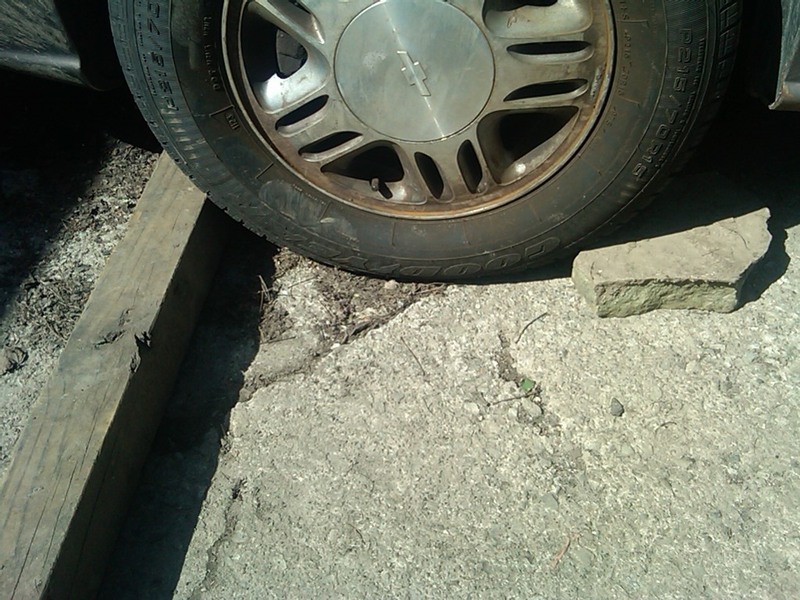 (2) Place stoppers (brick, rock, wooden beam) in front of the tires that are opposite from where you are working. 2. Use a heavy duty floor jack and place it under the van, on the side, positioning it somewhere around the middle of the frame. Avoid all hoses, lines, and tubing of any sort. 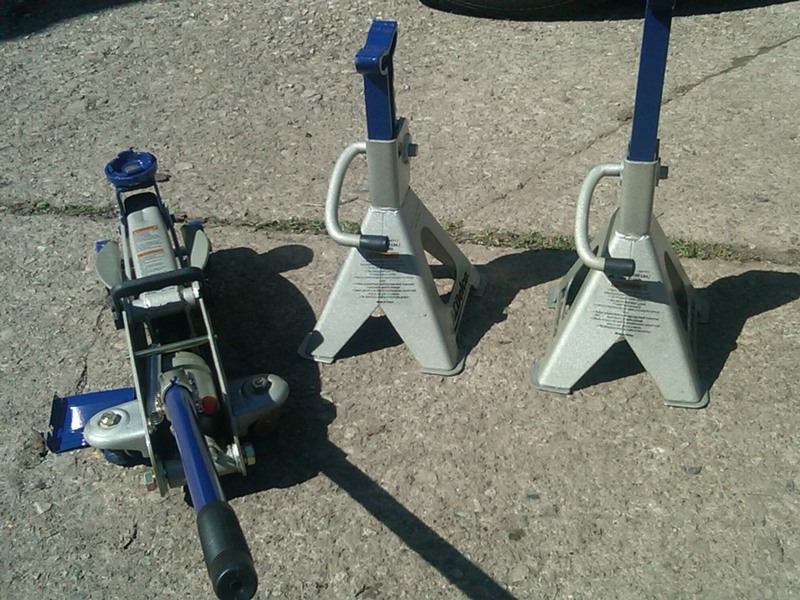 (1) Floor jack (left) and jack stands (right). 4000 lbs. weight capacity. , (3) Jack stand holding up van a few inches off the ground. 3. 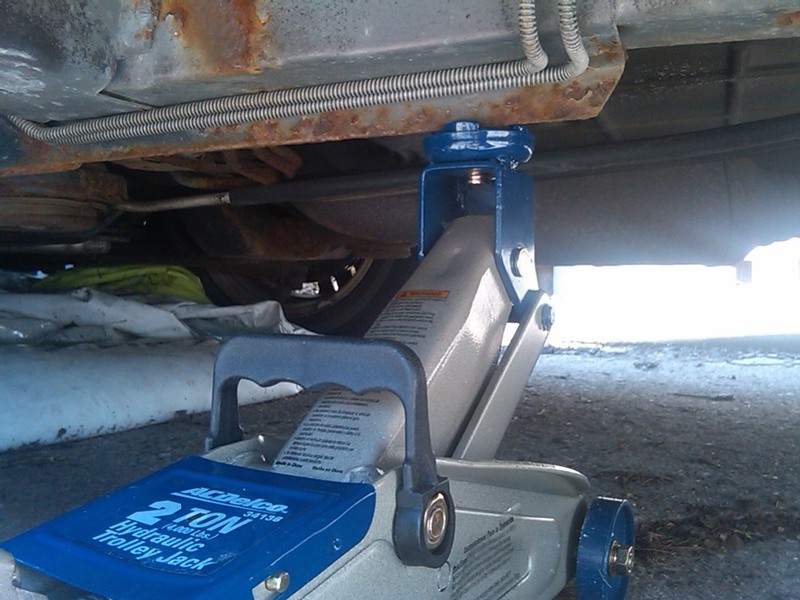 Slowly pump the floor jack (following manufacturers instructions) to lift the van off the ground until it is lifted high enough to comfortably work under (do not exceed the max height of your jack stands by more than a couple inches). 4. Set your jack stand(s) into place under the van on the frame underneath the van, placing one near the front behind the front tire, and the other jack stand should be placed near the back before the rear tire. 5. Slowly lower the floor jack (following manufacturers instructions) onto the jack stands and pull it out from under the van. You are now ready to work under the side of your van. To lift the back or front end of the vehicle, follow the same procedures, only this time place the floor jack in the middle back or front areas of (depending on where you're working) the van frame. Slowly pump the floor jack, put your jack stands into place, and slowly lower jack onto the jack stands. 1. Place the floor jack under van beneath the frame at the same place you used to lift the vehicle. Pump jack and lift van a couple inches above the height of your jack stands. 2. Remove the jack stands from under the van using caution not to bump or move the floor jack. 3. After the jack stands are removed from under the van, DO NOT go back under the vehicle. Slowly release the floor jack pressure to lower the van to the ground. 4. Pull the floor jack out from underneath the vehicle and remove the holding bricks, rocks, or beams from around the tires.